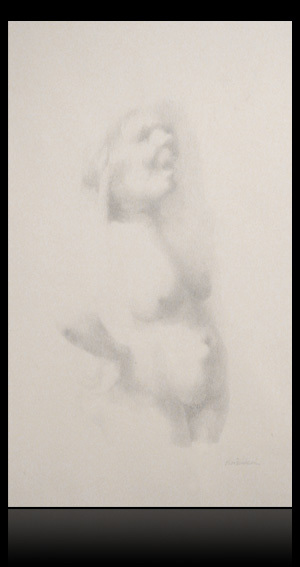 Chalk on paper, 37 x 21.5 cm (14.6 by 8.5 in). Signed. With the label of Feingarten Galleries, New York on the reverse. Period original and very decorative frame solid brass. Dimensions framed: 57 x 40 cm (22.4 by 15.5 in). The artist studied at the Stella Tyler School of Fine Arts, Temple University, NY 1942-43 with Rafael Sabatini, Queens College with Cameron Booth 1946-48, Institute of Fine Arts, NYU. He was together with Gabriel Zendel in Paris and toured across Europe. Been a member of the College Art Association and received numerous awards including: Joe and Emily Lowe Foundation Award, 1951; Fulbright Fellowship (Italy), 1957; University of Illiois, 1957; National Arts Club Annual, NYC, Stephens Award, 1958; Guggenheim Foundation Fellowship, 1960. Exhibitions: Roko Gallery, NY, 1951; Hewitt Gallery, NY, 1955, 57, 59; Vassar College, 1958; Robert Isaacson Gallery, NY, 1960; Feingarten Gallery, NY, San Francisco, Los Angeles und Chicago, 1961, 62; Feingarten Gallerie, Los Angeles, 1964; The Contemporaries, NY, 1964; Terry Dintenfass, Inc. 1967; Audubon Artists Annual, 1957; WMAA Young America, 1957; Fulbright Artists, 1958, Annuals, 1958, 59, 60, 62; Chicago /AI Annuals, 1957, 59; University of Illiois, 1957, 59, 61, 63; National Arts Club Annual, NY, 1958; Galleria Schneider, Rome 1958 (see Weller, Dictionary of Contemporary American Artists). Literature: Vollmer, vol 5, p. 497; Weller, Dictionary of Contemporary American Artists, p. 134. Fine and most impressive drawing, subtle and expressive, which also relates to the famous works of the German female artist Käthe Kollwitz. Excellent original condition.